Distinguished Alumni Award: Sam Miller, ’82, CEO, CareForce, Inc. This award recognizes a UW School of Nursing graduate whose career in nursing exemplifies excellence in clinical practice, leadership in professional organizations, outstanding accomplishments and contributions to the community. 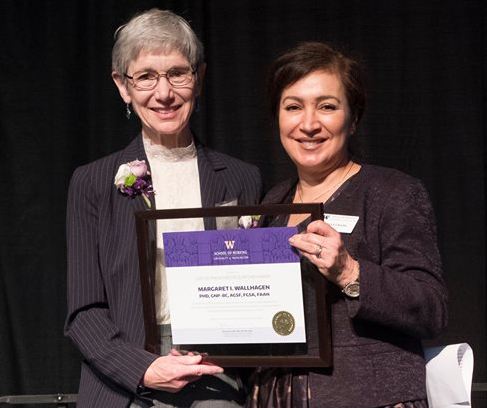 Only graduates of the UW School of Nursing are eligible for this award. Sam Miller obtained her MN at the UW School of Nursing in 1982. 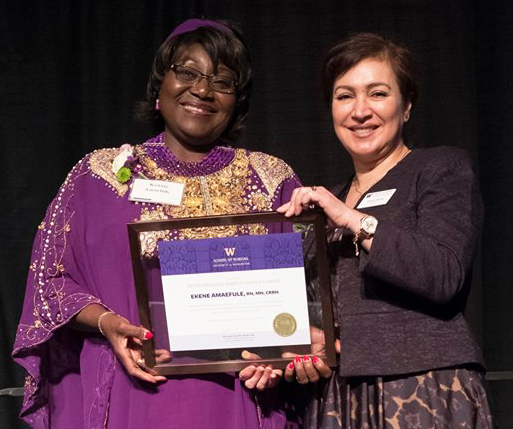 Her expertise as a psychiatric nurse practitioner and former university educator, commitment to quality nursing care, and business acumen make her an exemplary alumni of the School of Nursing. Sam is an innovator in the provision of quality home care services in this region, and serves as CEO and co-founder of Careforce, Inc, an award-winning home health care organization. She embraces the latest scientific evidence, successfully translates this science into practice throughout her organization, and demonstrates a commitment to excellent, ethical care. This award recognizes an individual whose research, professional achievements and cumulative contributions have brought personal distinction, enhanced the profession, improved the welfare of the general public and brought honor and prestige to his or her field. Margaret Wallhagen is a professor of gerontological nursing and a geriatric nurse practitioner at the University of California San Francisco School of Nursing. Margaret’s impressive career spans 35 years of outstanding contributions to nursing science, leadership, mentorship and nursing education. Margaret is internationally renowned for her work in gerontology and chronic care management. Her research focuses on the experience of control in caregivers and in persons with diabetes; successful aging for persons with chronic conditions; self-care and symptom management; cross-cultural interventions to support family caregivers with dementia; and the impact of hearing impairment on older adults. This award honors a nurse who demonstrates excellence in nursing care, serves as an advocate for patients, families and/or communities, makes a recognizable difference through his or her practice and embodies the essence of the nursing profession. 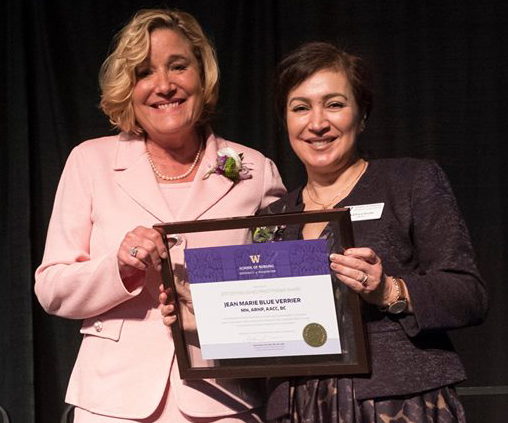 Jean Blue has had an extraordinary 20 year career as an Acute Care Nurse Practitioner in Seattle and served as a preceptor for UW ARNP students for nearly all of her professional career. Jean helped create the role of an ARNP within UW Cardiothoracic Surgery and independently served in this capacity for over 15 years at Northwest Hospital. Her advanced clinical skills are highly respected and admired by her ARNP, physician, and surgical colleagues. Two years ago, Jean left her refined clinical practice and accepted the newly created role of Chief Advanced Practice Provider for the Division of Cardiothoracic Surgery. This award honors a nurse who advocates for the needs of underrepresented populations and communities, encourages dialogue and reflection regarding societal power imbalances; and demonstrates leadership in promoting diversity in nursing. As the Nurse Manager of Rehab Care Services at the VA Medical Center, Ms. Amaefule is a strong advocate for her VA patients. Our country’s veterans are diverse and underserved. It takes a strong leader and advocate to ensures that our service people get the best care possible. Ms. Amaefule goes above and beyond for entire VA families while their loved ones are admitted in the hospital. Ms. Amaefule’s VA patients and families call her “our Angel” based on the way she makes them feel while going through extremely difficult times. Within the Seattle and UW community, Ms. Amaefule assists in feeding and clothing the homeless population through her church and other organizations she belongs to (see list below). On a global level, as the National Director of Caring Hearts International, a nonprofit organization dedicated to alleviating healthcare and social services crises in Nigeria, she is committed to providing equitable services to underprivileged communities through humanitarian projects. This award recognizes an individual who demonstrates excellence in nursing advocacy, patient advocacy, administration and leadership; serves as a champion for the nursing profession, actively seeks to improve nursing management, administration and goes above and beyond across the nursing practice continuum. 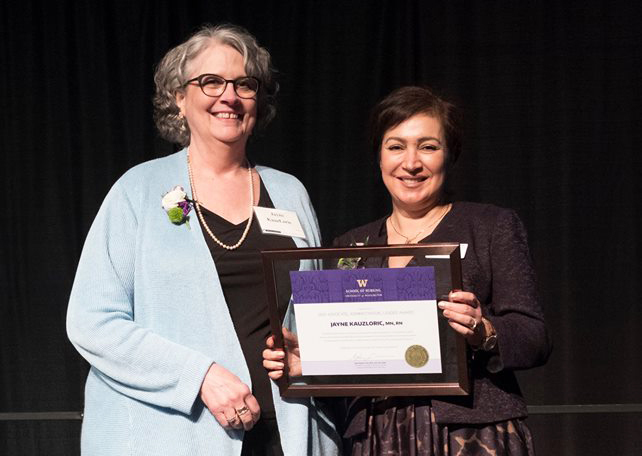 As a UW School of Nursing clinical instructor since 2000, Jayne has energized and inspired legions of students to invest the effort, care and commitment needed to have a real impact on people in local communities. As a Personal Health Services Supervisor of Public Health– Seattle & King County Nurse Family Partnership she has personally provided the leadership, creativity, innovation and advocacy that have resulted in many core programs serving the most underserved and needy members of the county’s communities. 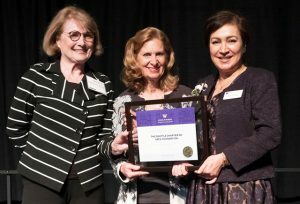 The award acknowledges an individual or group who embodies the ideals of the UW School of Nursing and whose leadership, dedication, and contributions reflect an ongoing commitment to advance the nursing profession. This award was created in honor and memory of Peter Dyer – nursing advocate, donor, and friend. This year’s Peter S. Dyer Heart of Nursing Award recipient, The Seattle chapter of the ARCS Foundation, has been a singularly important and impressive force in advancing the education of young scholars and in creating their commitment and dedication to the nursing profession. 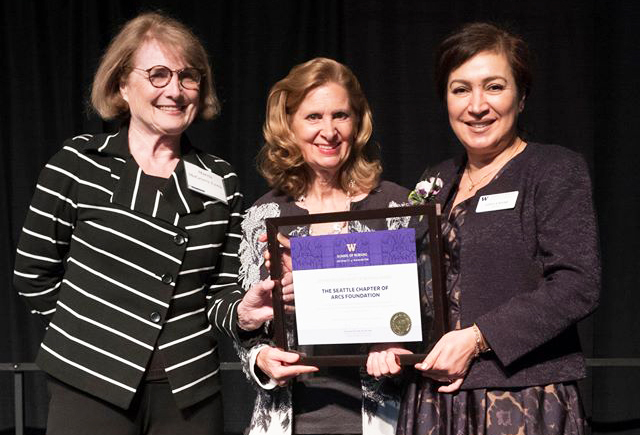 The members of the Seattle ARCS Foundation are champions of nursing science. 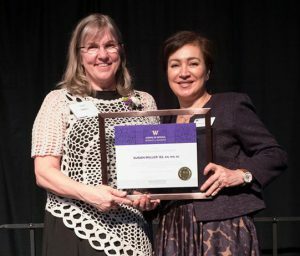 Not only was the Seattle ARCS foundation the first to award fellowships to nurse scientists, but their advocacy and leadership helped to bring nursing science into the folds of ARCS foundations nationwide.